Located in peaceful Arpora, Sun Village presents an indulgent, all-suite hotel experience within its landscaped environs. An imposing statue of Helios, the Sun God, welcomes guests to the resort. Tonatiuh: Air-conditioned a la carte restaurant serving a range of Continental, Indian, Chinese & Goan cuisine. Open between 7.00 p.m. and 11.00 p.m. from Monday – Thursday. Frangipani: Open to sky Barbeque & Grill restaurant, serving a variety of meats and fish dishes, as well as Tandoori fare. Open from Friday – Sunday between 7.00 p.m. and 11.00 p.m.
Sun Flowers: Buffet restaurant open daily for breakfast and lunch. 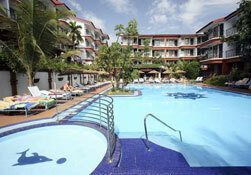 Also serves buffet dinners 5 times a week with extended seating by the poolside where regular entertainment is held. The Village Lawns: Open Monday & Thursdays from November to April. Gala buffets with exciting theme entertainment. Large swimming pool with kiddies pool and sunbeds, Health club, Massage parlour, Ladies and gents hair dressing salon, Shopping arcade, 24 hour taxi service, Safe deposit, Doctor on call, Money exchange, Parking facilities, Sight seeing excursion and boat cruises, Air conditioned pub with pool table, Second swimming pool in secluded and terraced garden, Conferencing facilities, Ayurvedic Spa. Superior Rooms: The Superior rooms are luxurious with an unique blend of antique furniture and trendy colours and furnishing. Rooms have additional facilities like tea / coffee maker, bathrobes, fruit and wine etc. The bathrooms have superior fittings and an extensive assortment of toiletries and a hair dryer are provided. Superior rooms are available as part of a superior plan (Plan Royals / Gold Plan) check tariff for details. Standard Rooms: Sun Village has large (450 sq ft). twin or double bedded rooms. Each room is distinctly divided into 2 parts: A sleeping area which has a bed, dressing table, large mirror and a spacious wardrobe. The living area is equipped with a sofa, coffee table, luggage rack, drinks counter, fridge and television set. All rooms have private balconies.